In Part 1 of this article, we discussed the intercession of Saint Gemma Galgani in a recent exorcism in Italy, as described in the book “The Rite-The Making of an Exorcist” (2009- Random House Inc). Encouraged and edified by this recent account of the assistance of Saint Gemma in the battle against evil, I was prompted to contact Padre Alfredo Pallotta C.P., (update: + R.I.P., born May 16, 1924, died July 24, 2012) a Passionist Priest who, until 2007 was for 13 years the Chaplain at the Monastery-Sanctuary of Saint Gemma in Lucca, Italy. Interestingly, Padre Alfredo is also a longtime exorcist, especially assigned to this ministry by the local Bishop. In his assigned capacity as exorcist, for 13 years Padre Alfredo performed countless exorcisms in a special room at the Monastero-Santuario di Santa Gemma Galgani in Lucca. 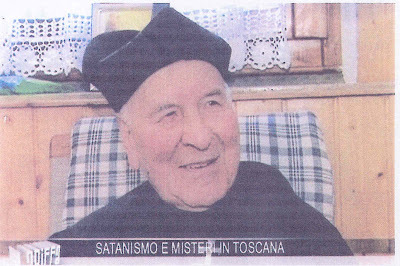 For years, people from all over Tuscany have sought him out in their battle against the demonic. He is also known for his extraordinary devotion to St Gemma, and has written four books and six prayer booklets in her honor. Padre Alfredo has also recently written a book entitled “Un Esorcista si Confessa” (An Exorcist Confesses) Edizione Fuori Commercio, 2005. On page 267 of this book, he writes about the extraprdinary prescence and heavenly assistance of St Gemma during an Exorcism that he was performing. He also writes that the demon(s) refer to her as "the stigmitized" or "the stigmatic". In his letter below, he lists the 4 books and 6 prayer booklets that he wrote in honor of, and devotion to Saint Gemma. So, in light of his experience in the battle against evil and his extraordinary devotion to Saint Gemma, I decided to contact Padre Alfredo for a written interview, and he kindly replied to my questions in the letter below. I have received your very nice letter. I do not know how you knew my name and my address. 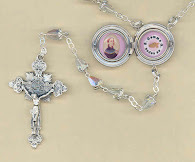 I am pleased to know you, even if only by letter, and that you are very devoted to Saint Gemma, and what you have done for the Saint with your web site. I offer many good wishes for your large family. I have been at the Sanctuary of Saint Gemma in Lucca for 13 years as confessor and exorcist. I have written some things about Saint Gemma which I have the pleasure of sending to you. I will now answer your three questions. 1) –You ask me about my devotion to Saint Gemma. I cannot not have it, above all after having lived 13 years in her Sanctuary. But every Passionist is devoted to Saint Gemma, because she had been a true Passionist who taught us all how one truly loves Jesus Crucified. She had been a faithful copy of Jesus Crucified. She had shared in all of the Lord’s Passion, from His agony in Gethsemani to His crucifixion and to the piercing of His side. 2- Friends of Saint Gemma. 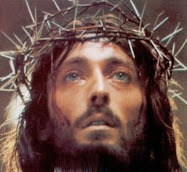 (In memory of the centenary of the stigmata – 1999. I am 85 years old. Next March 4th I will celebrate my sixtieth year of the priesthood. For the occasion I will publish anew: “An Exorcist Confesses: An Obedience and Mandate for the Sanctuary of Saint Gemma: Confessor and Exorcist”, which I printed for the feast of Saint Gemma and my birthday, May 16th 2005. 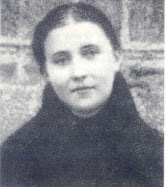 2) You ask me—if I understand correctly—if I can give you information on Saint Gemma that is not commonly known. This you could ask from the Passionist Nuns of the Sanctuary of Saint Gemma of Lucca, who know so many things about her not written but handed down by tradition. 3) You ask me finally that in my exorcisms if I have ever been assisted by Saint Gemma and if the Saint is a good advocate. Certainly she is a great advocate for exorcists. She has often been near me in the exorcisms, above all when I carried them out in her Sanctuary. She was present to help me in fighting the Fiend who had so often opposed her in life. The demon often informed me of her presence, calling her the “stigmatized”. You can also read of the presence of the Saint on page 267 of my book, “An Exorcist Confesses”, which I am sending you. On page 287-288 of the same book you can read a case of levitation that happened in the Sanctuary of Saint Gemma. In an exorcism—June 17th, 2007—the Fiend confesses that the “stigmatized” had called upon the Madonna to drive away some wicked spirits who were in the person I was exorcising. Dearest Mr. Glenn, I hope I have answered completely your requests. May the dear Saint Gemma assist you and protect you always, and may your site dedicated to her be able to do much good for all its visitors. 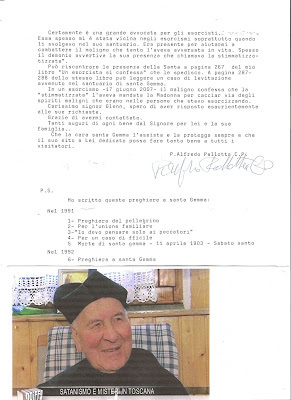 (signed) P. Alfredo Pallotta, C.P. Padre Alfredo now resides at the Passionist Community (Comunità dei Passionlstì ) in Colleramole, Tavamuzze, Fl Italy. As stated in his letter, on March 4, 2010 Padre Alfredo will celebrate his 60th year in the priesthood. We ask God to bless him and draw him ever closer to His Sacred Heart. ***Update: Padre Alfredo Pallotta C.P. 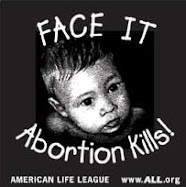 passed from this life to his eternal reward on July 24, 2012. 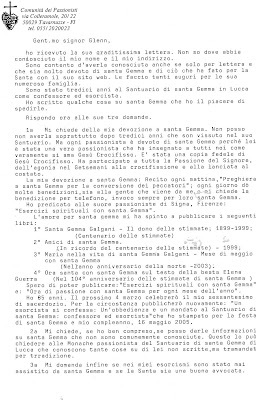 Back when I interviewed Padre Alfredo for the St Gemma website, the good Padre kindly sent me several of his books, and I was especially pleased with the book "Un esorcista si confessa: Un'obbedienza e un mandatodo al Santuario di santa Gemma: confessore ed esorcista"
By reading the book one can see that Padre was a devout priest, faithful to Jesus and the teachings of the Church. He was known for his deep devotion to the Blessed Virgin Mary, and also Sts. Padre Pio and Gemma Galgani. And in serving the people of God as a priest for over sixty years, many also admired Padre Alfredo for all the good that he did through his many exorcisms that he performed throughout the years. He helped countless souls by freeing them from the demonic. May God reward him for his many years of service as a priest after the Heart of Jesus. While I was in the Cathedral of the Madeline, in Salt Lake City, Utah, USA ... I invited Immaculate Virgin Mary and (there is a relic of St Mary Magdeline)St Mary Magdeline to do a field trip to attend a performance of the stellar kids choir... A heard a demon say when I felt the presence of Immaculate Virgin Mary... "SHE is here..."
Thank you Glenn for posting this. It's interesting reading that Gemma has appeared to people on quite a few occasions after her death. Other than the main articles listed on this website, do you know of any more appearances of Gemma? To reply to your question, well along with the articles and comments on this website I occasionally also receive emails and letters from those who profess to have received Gemma's intercession and heavenly help in many different ways. And they are often very inspiring and edifying. Best wishes and may God bless you and your loved ones!